There is a new anime box office champ. It’s Your Name, one of the best animated films I’ve ever seen. 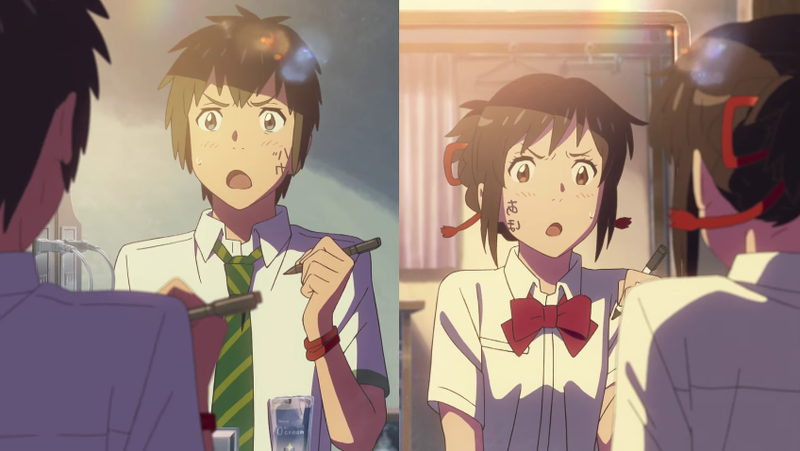 As Comicbook.com points out, Your Name is now the highest grossing anime film ever, earning US$281 million worldwide and surpassing Spirited Away’s $275 million gross. Your Name has been a smash hit in Japan, but as ANN adds, it’s also done spectacular business in China and South Korea, helping to propel the movie past the Studio Ghibli Classic. The film opened last August in Japan, and I tried to see it with my oldest son at the theaters, but they were sold out each time we went. Weeks and then months passed, and even with all the hubbub the picture was getting, I never got around to seeing the movie. I had pretty much forgotten about it until I caught it on a flight to the US from Japan. In a way, it was a shame to see it on a plane, because that’s hardly an ideal viewing environment. But I’m glad I finally saw it. Because, damn, it’s incredible. Your Name tells the story of a teenage boy and a teenage girl who switch places when they fall asleep. The basic plot reminded me of a dumb 1980s comedy. They switch places? And hijinks ensue? Eh... Typing that out, the basic concept, yes, still sounds a tad naff, but the movie transforms it, supersedes it, and goes to incredible emotional places. School boy Taki lives in Tokyo, while Mitsuha lives in rural Gifu. When they change places, Mitsuha gets to explore Tokyo and her masculine side, while Taki is in the countryside, dealing with being a young woman. This is a powerful, deeply spiritual film that deals with a whole host of themes: the contrast in Japan between rural and urban, religion and science, male and female as well as traditional and modern. These contrasts make up the heart of the film. In Japan, for example, there is a marked cultural difference between the city and the countryside—the inaka (田舎). There are linguistic variations, with people in different rural regions speaking with their own accents and dialects. Often, when people from the countryside move to Tokyo, they try to hide their local speak. Tokyo is exciting, and the countryside is seen as dull. There are also different types of speech for men and women in Japanese. When the characters switch places, they need to act more according to what Japanese society expects of a young man and a young lady, such as the specific pronouns they use. Your Name explores traditional Japanese culture, much like Studio Ghibli films do. However, this isn’t the countryside of a Studio Ghibli film, which is often idealized. There isn’t the same romantic yearning for the past found in many Studio Ghibli works. Rather, it’s a desire to either preserve it or break free of it entirely. That’s why in Your Name, characters might find traditional Japanese culture to be “old fashioned” or even embarrassing, having the desire to get out and go to the city. Your Name explores that, but also shows how traditional culture is kept alive, how that can seem like a heavy responsibility that isn’t for everyone. It’s that traditional culture, the indigenous religion and its beliefs, that strike a chord throughout the film. For about two-thirds of the film, Your Name is about young people opening up, growing, and experiencing new things. You get to know the characters. They can be awkward or even jerks, but they’re likeable. You want them to be happy. Then, Your Name makes a sudden turn, taking me to a place I wasn’t expecting. It’s brings to the forefront echoes of very real recent Japanese history in a mystical way that cuts through the fabric of time itself. I wanted to see Your Name again on the flight home to Osaka. Because, like the characters in the film, our memories are fallible. We forget things, sometimes, even the most important details. We try not to, but we do. There are moments in Your Name I will never forget. Nor will I forget sitting on the airplane, somewhere over the Pacific, fighting back the tears.